NEW YORK, N.Y. — From the company he built, from his offices on the 29th floor in midtown Manhattan, Mike Farrell on any day can survey the city for reminders of his father. Skyscrapers bear his father’s imprint. So do subways. Across the river, so does a primary school in Old Bridge, N.J. And soon, nearly 600 miles away, Wake Forest will, too. MIKE AND HIS WIFE, MARY FLYNN FARRELL, of Summit, N.J., parents of alumnus Michael Edward Farrell (’10), made Wake Forest history in October with their pledge to give $10 million toward the construction of a building for the Schools of Business. To be paid over three years, the gift is the largest cash commitment by a living individual in the University’s history and the largest donation to date to the business schools. With construction set to begin this spring, the three-story, 110,000-square-foot center estimated to cost nearly $50 million will be named Farrell Hall in honor of Mike’s late father, Michael John Farrell, and underscores the Farrells’ support of leadership excellence in business and education. “I can hear him laughing to say that’s his name up there,” Mary says from her yellow wingback chair in her husband’s offices on Avenue of the Americas in Midtown. Dressed in his charcoal-gray cardigan buttoned up Mister Rogers-style, Mike sits in a matching chair in an office that features, he points out, Deacon colors. Mike and Mary smile at the thought of their gift, this tribute to a blue-collar Irishman so intimidated by higher education that he refused to set foot on the campus of Trinity College Dublin, around the corner from where he grew up. “He felt like he didn’t deserve to be around college kids,” Mike has said. “He literally had to be dragged onto the campus grounds.” Mike and Mary took him to Trinity College in 1983 when they met Mike’s parents in Dublin on a stop during their honeymoon. His father wore a suit for the occasion. The photograph from that day remains one of Mike’s favorites. IN DAYS GONE BY, ACROSS THE OCEAN, Farrell ancestors lived large. During medieval times, they were the O’Farrells, the reigning clan of Longford. They ruled from Annaly Castle in Ireland, which exists now only in family lore, and, in midtown Manhattan, in the crest dominating the logo and the handcrafted reception desk of Annaly Capital Management, Inc., the largest residential mortgage real estate investment trust listed on the New York Stock Exchange. 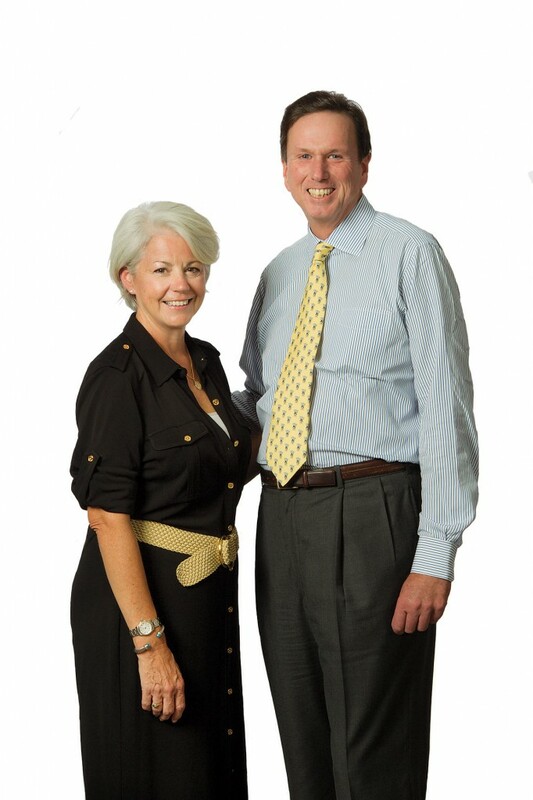 It is the company, one of several, that Chairman, Chief Executive and President Mike Farrell has built with great success in the last two decades. His companies manage over $90 billion of primarily agency and private-label mortgage-backed securities. The Farrell patriarch would follow the hardscrabble path of European emigrants to 1940s Manhattan, a journey worlds apart from his son’s. But first, as a young soldier, he saw combat. A member of the Irish Guards, he was part of a failed, devastating campaign by the Allies in September 1944 known as Operation Market Garden. Thousands of British troops died, among them an Irish tank driver named Austin Michael Murphy. “I found out recently that my dad was the only one to walk away from the tank,” Mike says. His namesake is that tank driver, his father’s friend, buried in Arnhem Oosterbeek War Cemetery in the Netherlands, his gravestone visible when Mike did a Google search combing for signs about whether to make the Wake Forest donation and lend his father’s name to the cause. 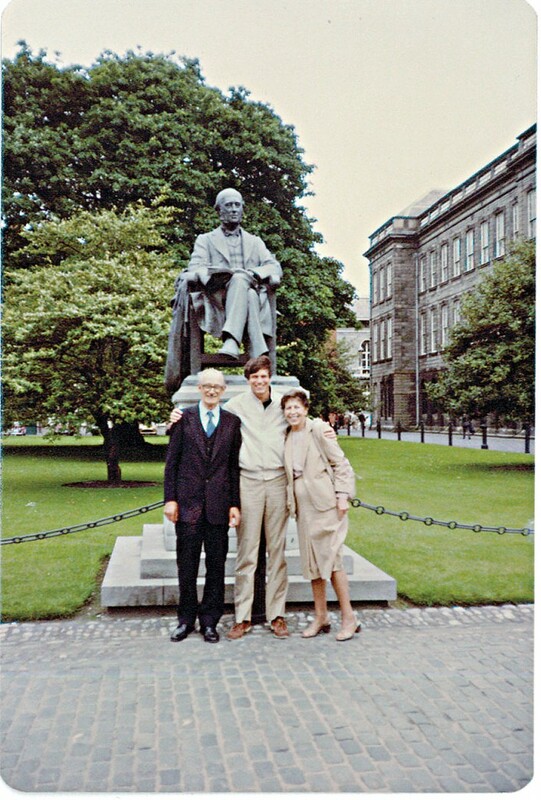 Mike Farrell (center) with his parents, Michael and Vera, at Trinity College, Dublin, in 1983. AFTER THE WAR, THE ELDER FARRELL and his wife, Vera, left Europe for America, and it was in New York that Mike’s dad found a place in the real estate boom. Waterproofing and caulking skyscrapers: those were his jobs. He clocked in workdays atop scaffolding hanging from unimaginable heights until he could bear it no more. Vertigo in his early 50s sent him to toil for the betterment of the city’s depths, no longer its heights. He became a painter of subway cars for the New York City Transit Authority. Later, he would land his prized job: janitor at an elementary school in Old Bridge, N.J. He cleaned the kindergarten and first-grade classrooms, where students would leave him notes. “He glowed when he would bring those notes home,” Mike says. THEY MET AT A WALL Street firm — Mary was a sales assistant for a time — and married. 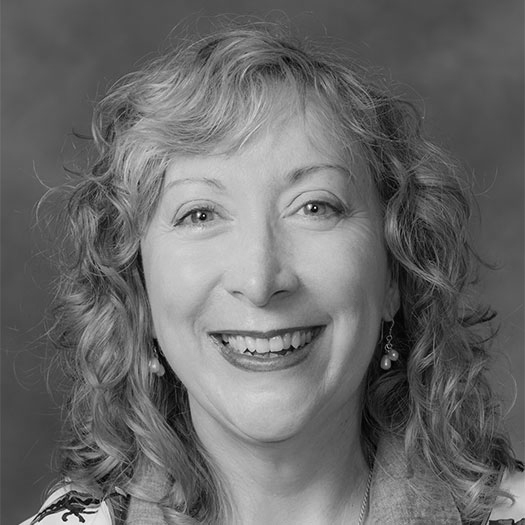 The Farrells’ financial success created a markedly different life for their three children. Their eldest, Caitlin, graduated from College of the Holy Cross in 2008. Their son majored in finance and economics at Wake Forest. Their youngest, Taylor, is a high school senior. Caitlin works for her father in his Boston office, Michael Edward in New York, “a taxpayer now,” his father notes by way of introduction. The Farrells praise their son’s experience at Wake Forest as intellectually rigorous and socially vibrant. “We believe in the school,” Mary says. “It definitely comes under what our philosophy is, where things should be going.” The Farrells speak of the values-based education they saw at the University, with Mary’s definition of values as “civility, responsibility and accountability.” A founding member of the Schools of Business Board of Visitors, Mike was struck by Bill Leonard’s speech marking his retirement as dean of the divinity school; President Nathan Hatch’s quest to educate “the whole person” and his willingness to discuss faith; and Provost and Professor Emeritus Edwin G. Wilson’s (’43) speech about Wake Forest’s being a unique institution where friendliness and honor remain touchstones. WHILE THEY ACKNOWLEDGE QUIETLY providing donations for educational causes in the past, particularly Catholic schools in their area, the pledge to Wake Forest is their largest and most public gift. Farrell Hall, expected to open in the summer of 2013, will use state-of-the-art technology and groundbreaking design to foster heightened faculty-student engagement, which the Farrells hope will encourage Socratic inquiry, mentoring and conversations among graduate and undergraduate students that might spark innovation.